London is known for museums, sightseeing, nightlife, shopping, and historic sites. Your plan includes some of its best attractions: get a new perspective on nature at Natural History Museum, ponder the world of politics at Houses of Parliament, don't miss a visit to Tower Bridge, and contemplate in the serene atmosphere at Westminster Abbey. For reviews, photos, where to stay, and tourist information, read London trip generator. Kuala Lumpur, Malaysia to London is an approximately 17.5-hour flight. You'll gain 8 hours traveling from Kuala Lumpur to London due to the time zone difference. Prepare for cooler weather when traveling from Kuala Lumpur in April: high temperatures in London hover around 17°C and lows are around 8°C. 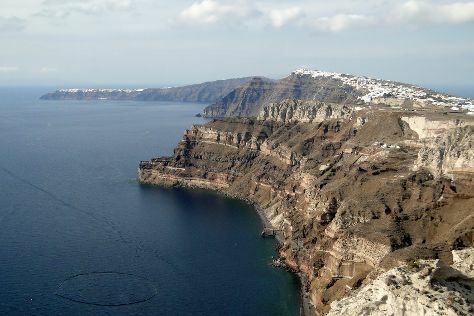 Finish your sightseeing early on the 30th (Sun) to allow enough time to travel to Oia. On the 30th (Sun), view the masterpieces at Mnemossyne Gallery and then pause for some serene contemplation at Ekklisia Panagia Platsani. For traveler tips, reviews, photos, and other tourist information, refer to the Oia itinerary builder. Traveling by flight from London to Oia takes 5 hours. Alternatively, you can take a bus; or do a combination of car and ferry. Traveling from London to Oia, you'll lose 2 hours due to the time zone difference. Expect somewhat warmer temperatures when traveling from London in April; daily highs in Oia reach 22°C and lows reach 15°C. Finish your sightseeing early on the 2nd (Tue) to allow enough time to travel to Nice. Go for a jaunt from Nice to Agay to see Massif de l'Esterel about 52 minutes away. And it doesn't end there: get to know the fascinating history of Vieille Ville, make a trip to Promenade des Anglais, examine the collection at Musée Marc Chagall, and admire the striking features of Palais Lascaris. To find maps, reviews, more things to do, and tourist information, refer to the Nice trip itinerary maker. Traveling by flight from Oia to Nice takes 5.5 hours. Alternatively, you can take a bus. You'll gain 1 hour traveling from Oia to Nice due to the time zone difference. Traveling from Oia in May, expect Nice to be slightly colder, temps between 24°C and 17°C. On the 6th (Sat), wrap the sightseeing up by early afternoon so you can travel to Venice. When in Venice, make a side trip to see Scrovegni Chapel in Padua, approximately 42 minutes away. There's lots more to do: explore the activities along Canal Grande, admire the striking features of Doges' Palace, take in the views from Ponte di Rialto, and get to know the fascinating history of St. Mark's Square. For more things to do, other places to visit, photos, and tourist information, refer to the Venice vacation builder. Fly from Nice to Venice in 4.5 hours. Alternatively, you can drive; or take a train. In May, daytime highs in Venice are 25°C, while nighttime lows are 15°C. Cap off your sightseeing on the 10th (Wed) early enough to travel back home.